It activates the throat chakra that energizes the head. It brings in the clarity of the mind. Apart from that this can be helpful for bad throat condition also. When you are stuck in a problem situation, be in this Mudra and chant the switch words, “CLIMB CRYSTAL TOGETHER DIVINE”. To sit regularly for a meditation, even though if it is escapism, be in this Mudra, and you will continue to sit for the meditation. It is also called as Mudra for Surrender. What is meant by surrender? Surrender is not inaction. Whatever we are doing we have do it. You are writing with a pen. Suppose the pen gets a life and says, “I am writing so many things”. Will you accept it? The pen is not supposed to say that and that to you. Let us say the pen says to you that “I am writing so many things. So many good ideas come to me, when I am writing”. If so, you will break the pen and will go for a new one. Similarly, surrendering means, the attitude of ownership is relinquished. ‘I am not the doer’ – that attitude should be cultivated. It is the training of the mind. That can be cultivated or trained by being in this Mudra. Everything is coming from the space. Because of the divine, we are doing something. You are doing the action for the divine, by the power of the divine and with the help of the divine. That attitude has to be ingrained in every part of the brain. For which, this mudra will be very helpful. How to understand and believe that you are not the doer? It is not the question of understanding. How to believe we are not the doer, but divine is the doer? 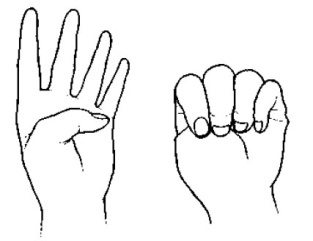 Instructions to do the Mudra: On both the hands, keep the thumb at the base of the little finger (first image) and rest of the fingers covering the thumb (next image). My son, Siddharth has completed M. Tech in Bio-technology. But still not found a job. He is already 24, and I am very worried and tensed. Kindly help us. Already giving him WALNUT and SWEET CHESTNUT plus started chanting from yesterday, “FIND DIVINE ORDER COUNT NOW DONE”. This is just FYI. Pls guide us. Tap on yourself, “I accept myself totally”. Be in Pran Mudra for 20 minutes a day. He will get a job. I have started doing Pran Mudra for 20 minutes daily. Also taking Bach flowers, I am feeling much better. Now the anxiety for getting job for my son is slowly decreasing. Since I do not know tapping, I am just affirming “I accept myself totally” is it ok? Thrice a day. Need your kind advise. My son has not yet got the job. One of our family friends is trying the job for him in the pharmacy line only, which is his line and preference. Kindly pray that it should happen urgently and need divine advice. Somebody predicted that he will go on changing the jobs till 2012 and will get best job only in 2013 (i.e., he will settle in the job only in 2013). I am feeling very depressed. But at the same time I feel that GOD can do anything. Pls advice. Write WALNUT around your son’s name. Take a piece of paper. Write the name. Draw a circle around the name. Draw another concentric circle around the first circle. In the gap, write walnut and keep it. Don’t do anything else other than this. Chant OM LUM NAMAHA. Om Lum Namaha if chanted alone will stabilize him. Chant this mantra alone for 300 times. At last, my son got job of his liking. Even though the salary is not that great, at least I feel that divine door has opened for him. The job is like meeting top Doctors / Gynecologists and prospective customers and present about their products. What he should chant so that their prospective clients become their permanent customers or which mantra to be chanted. Write VERVAIN, OAK, HEATHER in a piece of paper and ask your son to keep it with him. Let him see the names and thank these flowers daily before making the calls. After coming back let him recollect the day’s proceedings and thank each and every incident and persons concerned.